Ever wondered what it is like to trade with an Australian binary options online broker? Australian binary traders are generally spoilt for choise when it comes to choosing a broker. However we have found HighLow to be one of the very best of these binary brokers. They offer some of the best trading conditions, including payouts up to 200%, an amazing $50 no deposit bonus which comes with literally no strings attached and a free demo account which is generally very hard to find with binary brokers. The HighLow binary options online brand is owned and operated by HighLow Markets Pty Ltd, an Australian derivatives and forex brokerage company. The company is licensed and regulated by the Australian Securities and Investment Commission (ASIC), and operates with AFSL license number 364264. The company is based in Sydney, Australia. The company, which was incorporated in May 2010, is the brainchild of industry professionals. The following assets can be traded on HighLow. Currencies: AUD/JPY, AUD/NZD, AUD/USD, CAD/JPY, CHF/JPY, EUR/AUD, EUR/GBP, EUR/JPY, EUR/USD, GBP/AUD, GBP/JPY, GBP/USD, NZD/JPY, NZD/USD, USD/CAD, USD/CHF, USD/JPY. Indices: ASX200, Nikkei225, Hang Seng (HKG33), DAX30, CAC40, FTSE100, Dow30. Traders on the HighLow platform receive $50 in cashback upon signing up with the brokerage. But is that all that HIghLow has to offer in terms of bonuses and VIP programs? Well, surprise, surprise. The $50 cashback happens to be the only bonus that traders on HighLow can enjoy. The cashback can immediately be withdrawn for cash without the trader being subjected to ridiculous trade turnover requirements. The HighLow trading app can be downloaded on the Google Play store (Android devices) as well as the Apple Store (iPhones and iPads). Despite the new Apple policy of discontinuing support for binary options online apps, the HighLow trading app is still listed for downloaded on the app store. Credit/debit cards: Cards issued by VISA and MasterCard are the only card brands accepted on the HighLow platform. The minimum deposit amount is $50 and transactions are processed in an instant. Bank wires: Bank wires are a secure but slower method of transaction, allowing the trader to deposit $50 minimum. However, transactions may take 1-3 days to complete. Digital Wallets: Neteller is the only international digital wallet platform available to HighLow users. Deposits are processed instantly and the minimum deposit amount is also $50. Other methods: The other methods of transaction are the country-specific digital wallets such as PaySafeCard, GiroPay, Sofort, Abacooq, SoroPay and Poli. Transactions are processed instantly. These methods allow transfer of funds using their wallets, by bank wire or by card, as they all integrate with these methods of transaction. Transactions are handled in a very efficient manner by the HighLow team. The base currencies for accounts on HighLow are the USD, AUD, Euro and GBP. Minimum trade size is 10 units of base currency. Maximum trade size is 2,000 AUD or USD, or 1,000 GBP/1,500 Euros. Phone: A dedicated Australian phone support number is available on weekdays between 09:00 to 04:00 AEDT/AEST time. The number is 1300-870-442. There is also an online contact form. Generally speaking, HighLow does not have a very good customer support system and this area needs to be vastly improved upon. For new traders, there is a $50 cashback which is provided merely for signing up with HighLow. Traders can open a free and unlimited demo account with $10,000 in virtual funds to enable them practice binary options online trading without risking any money. Traders also get periodic cashbacks on trades, which are all redeemed into cash that can be withdrawn from the trading account. There is an option trading schedule which details the trading hours of each binary options online asset listed on HighLow. HighLow is simply put, one of the best binary options online brokers in the business. Traders who use HighLow can be assured of transparency and a great trading experience. HighLow is a regulated broker. Regulation provides the perfect environment for transparency. Traders’ funds are kept in a segregated account in conformity with regulatory requirements. This ensures that traders’ funds are safe. HighLow offers some of the best industry payouts. Protection of traders’ sensitive data is guaranteed with standard industry-level encryption. Withdrawals are fast and professionally handled. Some of the disadvantages have been mentioned above, but are reiterated again. ASIC has very restrictive policies on who can trade binary options online in Australia. Therefore, traders from many countries cannot open accounts with HighLow. HighLow does not have a robust customer service department. Here are some questions that are frequently asked about HighLow. The answers are provided below. Is HighLow a regulated broker? HighLow is regulated and licensed to provide binary options online derivative brokerage services by the Australian Securities and Investment Commission (ASIC). ASIC is the regulator of all financial markets in Australia. 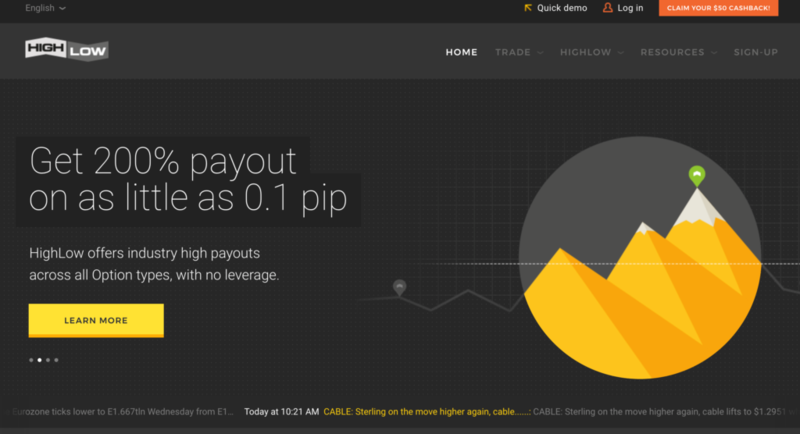 Can I trade with a binary options online robot on HighLow? At the moment, it is not possible to trade with binary options online robots on HighLow. However, in such a dynamic market, nothing can be ruled out. Can I trade binary options online on my smartphone with HighLow? The HighLow platform is available as a mobile app. The app can be downloaded from the Google Play store or Apple’s app store. How can I deposit or withdraw funds on HighLow? You can deposit or withdraw funds on HighLow using several means of transaction. Several credit/debit cards, digital wallets and bank transfer options can be used and are described above. Are there any scam reports about HighLow? HighLow is a very genuine broker with no scam reports whatsoever. Traders can use the HighLow platform confidently. However, vigilance is required on the part of traders to continuously check the status of HighLow on the ASIC website. I have some Bitcoin. Can I deposit funds with Bitcoin? At the moment, it is not possible to deposit with Bitcoin on the HighLow platform. Can I trade Bitcoin on HighLow? Bitcoin is presently not offered for trading on the HighLow platform. Does HighLow provide bonuses for its traders? The only bonus provided by HighLow is a $50 cashback given for successful signup on the HighLow platform. Do I need to generate a certain trade volume to cash out the $50 cashback? HighLow does not impose any trade turnover requirements on the cashback amount. Once your account is funded with the cashback, you can withdraw it after the first trade.